This ought to grab their attention. 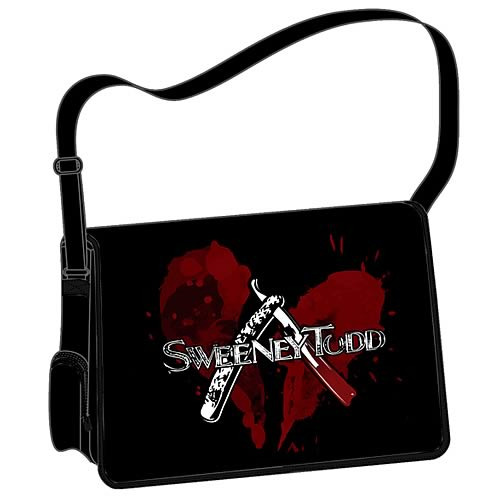 Carry your valuable possessions-- and your razor-- in this durable messenger bag that features the Sweeney Todd logo. And watch the heads turn! The handy black bag features a bloodied broken heart, along with Sweeney's signature bloody razor and moniker. Wow your friends and warn your enemies with this impressive and useful reminder of Tim Burton's musical motion-picture adaptation of Sweeney Todd: The Demon Barber of Fleet Street! Sweeney Todd: The Demon Barber of Fleet Street is an Academy Award nominated 2007 musical film adaptation of the Stephen Sondheim and Hugh Wheeler musical of the same name. The movie stars Johnny Depp in the title role, in his 6th collaboration with director Tim Burton. Helena Bonham Carter also stars as Mrs. Lovett. The film was released in the United States on December 21, 2007 and in the United Kingdom on 25 January 2008. It won the 65th Golden Globe Award for Best Motion Picture (Comedy or Musical) and Best Actor (Comedy or Musical). This article uses material from the Wikipedia article "Sweeney Todd: The Demon Barber of Fleet Street (2007 film)" and is licensed under the GNU Free Documentation License.